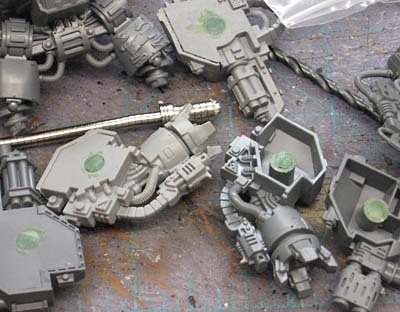 As part of an ongoing commission, I picked up two dreadnought bodies and 11 arms that needed to be magnetised. No problem I thought, they're just dreadnoughts right? I know more of you have done this and it would have helped me greatly if you'd sent your stuff in so it was there for reference! Let's get on it people. There was only one problem with my project. Actually there was more than one, but I had one big one. I had lots of different arms and two DIFFERENT dreadnoughts. Of course they're different you say... you have two models. That's not it. One was a "regular" dreadnought and one was from "Black Reach." The biggest difference is the diameter of the arm pegs. Arms for one version will not fit on the other and vice versa. I love GW. I knew I was going to need to cut the pegs off and find a way to magnetise the arms to the torso and still keep both inside facing surfaces (the body and the arm) smooth so the arms did not sit away from the body and create an unsightly gap. First thing I did was cut the arm pegs off both torsos. I knew it had to be done and I felt like I was making progress even though I really wasn't any closer to solving my problem. And then it came to me, I wasn't sure if it would work, but I thought with 11 arms, I had one to spare as a "test." 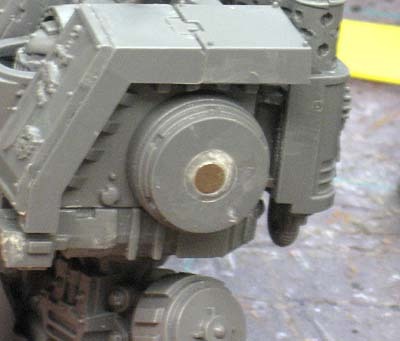 The plan was to add a magnet flush with the torso where the peg used to be and then fill the hole in the arms with greenstuff and then insert a magnet flush with the surfaces there. If it worked, it would align the arm in the proper position on the body, keep it close so there was no extra "gap" and be fairly easy to do. It was the last part that had me worried most of all. I grabbed my 1/8 inch drill bit and my rare earth magnets that I picked up from my FLGS (Game Vault) and went to work. The smallest magnets I have fit perfectly into a 1/8 inch hole. Add a little superglue and it's there for good. NOTE: I know we all know this one, but it bears repeating... always pay attention to the polarity of your magnets. Both dread torsos had to be the same in this case so all the arms would be interchangeable with either body. This was a constant source of double and triple checking everything before gluing anything in place. Then I filled all the arm holes with greenstuff. I let it cure overnight just to be on the safe side and then set about drilling all my 1/8 inch holes for the magnets into the arm holes... that I had just filled. With both pieces now magnetised it was time to test my theory. Much to my amazement, it worked perfectly. I made sure when I glued the magnets into the torsos that I kept them flush and as perfectly vertical as possible. When I would glue a magnet into an arm, I would glue it in and then attach it to both dreads real quick to make sure it was properly aligned and didn't look off balance on either one. On most arms, it only took a slight adjustment to the arm magnet while the superglue was still drying to get it just right. And the end result. The arms are not heavy enough to rotate the magnets so there was no need to engineer any type of device to keep them upright. The huge powerfist arms are heavy and do have a tendency to rotate the arm down, but that's the correct position for the arm as it is so it looks correct in the end anyway. 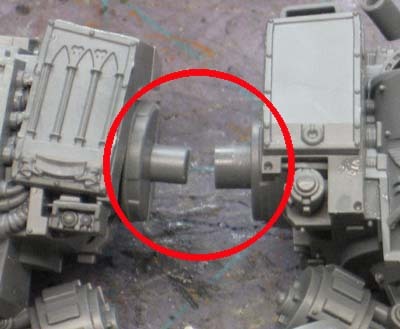 And if you're wondering about the autocannon conversion, that tutorial can be found right here. And that's it, simple as that. As a side note, one of the dreads I received needed some work done to the front of his torso. He was the victim of a failed conversion and it was up to me to bring him back to his former glory. I figured I could replace his front piece with a new one but would have to sculpt something for his side panels. A quick glance through the Forge World site for some inspiration, and I had this. I cut two panels out of plasticard and sculpted some wings one each one. I also added half of the chapter symbol on each side for good measure. This pic doesn't show it, but I also made some larger purity seals and added them later on to show his Veteran status. Disaster averted. 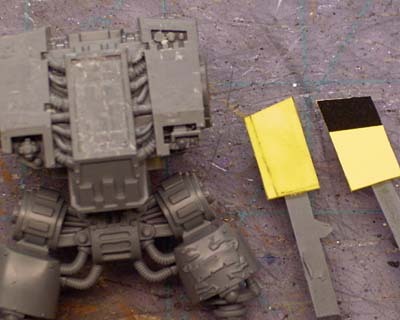 Here are the completed magnetized dreadnoughts with all their arms. Great tutorial and love the GS bit at the end. 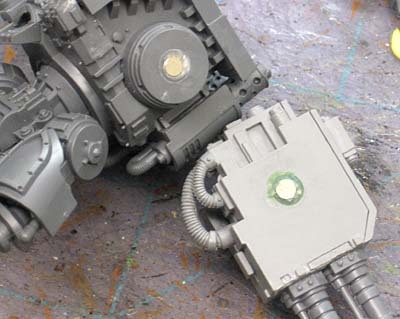 Would it not have been better to use magnets in the body and bits of metal in the arms, thereby making your magnets go further and also not having to worry about polarity? Kirby: Thanks. wait until you see the finished model, I added purity seals and spent some time detailing the center elements. Tom: Sure, there are a bunch of ways to "magnetise" models. I just needed to make sure the connection would hold well enought and I wouldn't end up with any extra space between the torso and the arms when done. Very nice dreads and tutorial. Also love the reaper autocannons. Some day I have to try this. 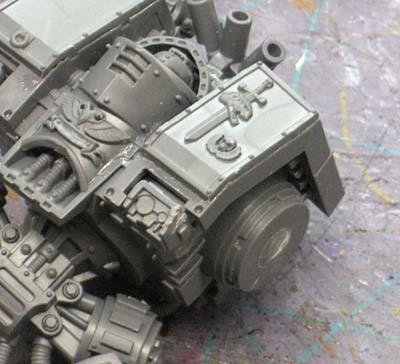 Aiwass: It's a fairly simple conversion and I love fielding a mortis pattern dread with autocannons. It can cut through most anything with ease. Very inspiring! This makes me think about buying some additional dreadnought arms for my AOBR one. 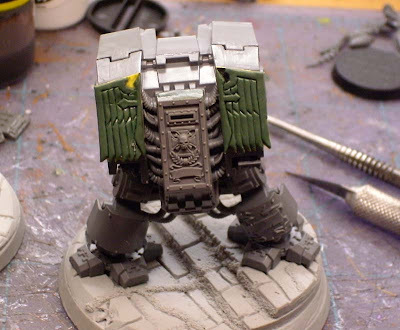 Ergotoxin: I've got two venerable dreads for my next Deathwing army that I'll be doing this very same thing on again. 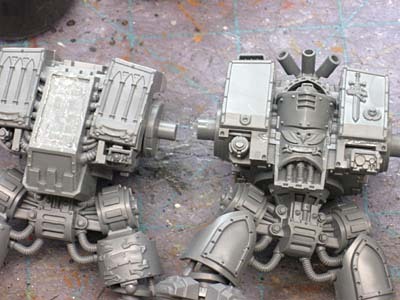 I'm not afraid of conversions, on the contrary, but I have no dreads, and with the Codex chaos space marines I can't go for Rifleman dreadnoughts, just one reaper autocannon right arm. But hey, I noted it in my 'to do' list. I just cut off the nubs from the shoulders (like you had) and glued them in to the arm mount holes, then drilled my holes for the magnets. Of course, that only works for one set of arms. ;) Green stuff works just as well. great article. Awesome sculpting. 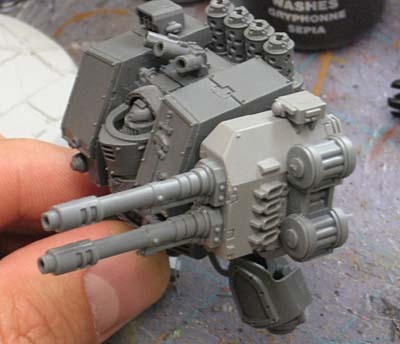 I wonder if anyone has compiled a list of what magnet sizes work best for what models (tank weapons, dreads and walkers, troop arms, etc.) I am gonna try to start saving them on a spreadsheet as I go. Regarding arm rotation on magnets, what's a good solution? My Tyranid Prime's bonesword arm (http://mwts.blogspot.com/2010/12/my-lazy-tyranid-prime-conversion-part-3.html#more) suffers from that a bit, tends to droop down, and I'm concerned about that being more of a problem with the metal bonesword arm from the hive tyrant. Atreyu@4:44 I came up with a solution when I magnetised the arms on an Eldar Titan. Check out this post, it might help. I also helped a friend with a magnetized Trygon by putting a pin at the 12 o'clock position, but only glued on one side. that way when you attach the piece, it will stick, but the pin helps keep the pose you intended. Mr.Esty: No problem, glad it helped. Paint My Figs: I've heard about using a pin, but have never tried it myself. Sounds like it wqorks just as well when it comes to keeping an arm in the correct position. I like to file down most, but not all, of the nub on the body and then drive a small nail in there. that way you only need to use 1 rare earth magnet, and the polarity doesn't matter. RE's are plenty strong to only use one. I modified some AoBR arms to fit regular dreadnought body, but it was for a friction fit, not magnets (http://paintpotprocrastinator.blogspot.com/2010/07/dreadnought-arm-modification.html). I didn't have to worry about the AoBR body though, as I had regular bodies. This is a good solution, and much more flexible in the long run than my effort. Thanks for sharing. I had forgotten about the Mortis pattern arm conversion you did. I may have to try that.